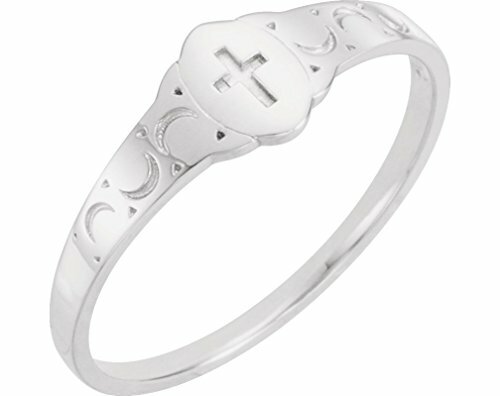 This cross ring is a symbol to assist in remembering the words of Jesus Christ to help make each day a living testament of actions in the small and big moments of life; for the reminder of faith during times of change, and to remember she/he is loved, always, all ways. Rhodium is hypoallergenic; it is a liquid metal extracted from platinum after being pulled from the mine. Rhodium plating makes a hard, smooth finish, creating a gorgeous white on gold giving it a very deep shine and is hypoallergenic. It is fitting this special ring is crafted of gold; it is said spiritual energy and power are activated and awakened by wearing or praying with gold. Gold represents the spiritual treasure gained by transforming the spirit; gold also represents love in the Bible. Proudly made in America with a green process of ethically, environmentally and socially responsible production processes of water, waste and energy management.